A fortuitous combination of personalities, design objectives, and creativity can produce spectacular results, and that certainly was the case in the remodel of this fabulous residence in Huntleigh. 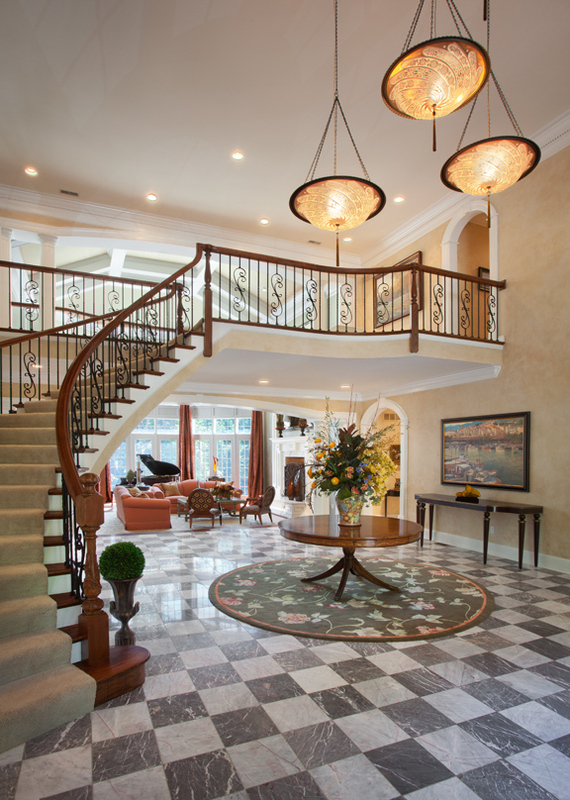 Suspended at varying heights, four hand-crafted Fortuny lamps illuminate the expansive foyer. Overlooking the pool, outdoor kitchen and tennis court, the great room features warm apricot tones, Italian silk drapery, a sculptured silk rug from New Zealand and a huge antiqued mirror over the fireplace. 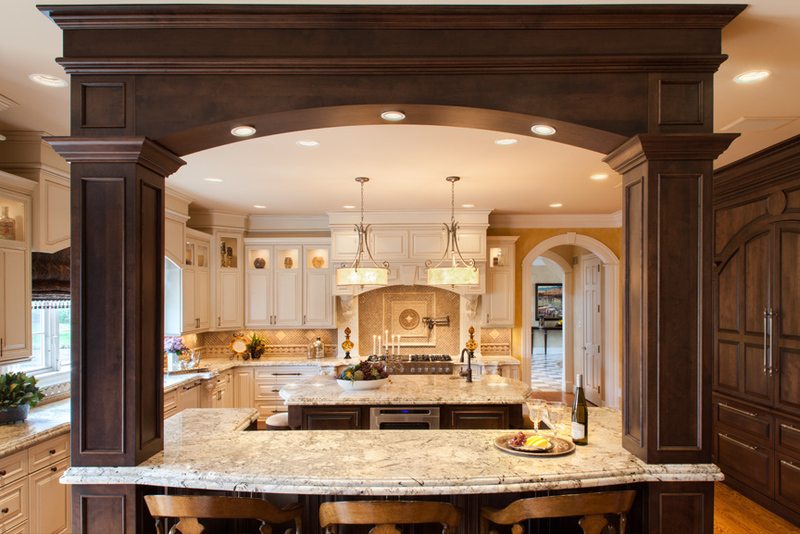 A bi-level island breakfast bar, defined by a handsome arch and topped with matching granite from Graniterra, separates the kitchen from the breakfast room and coffered hearth room. Blanketed in wood, the elegant study showcases a crocodile leather sofa and cocktail table from KDR Designer Showrooms and a Turkish wool area rug from Rugs to Riches. In the formal dining room, decorative niches flank a serene waterscape, rendered on wood panels by Louisiana painter Jill Hackney. 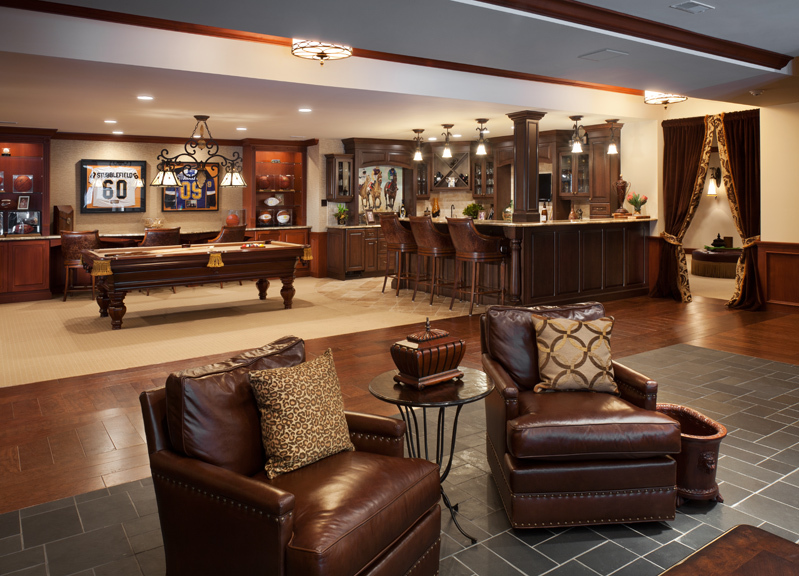 Filled with treasured sports memorabilia, the vast entertaininment level was totally renovated and can handle the largest of social gatherings. Purchased three years ago, the 12,000-plus-square-foot multi-level was built in 1996 and is surrounded by magnificent grounds that the new owners describe as “like a park, incredibly peaceful and quiet.” The original home, however, was decidedly formal in style, and the couple hoped to create an environment that was “less traditional, more comfortable and livable.” What they envisioned was a relaxing retreat for their soon-to-be-blended families and a great place for entertaining. The husband, an executive with a major corporation headquartered in St. Louis, could see the home’s potential from the outset; he’d already lived in multiple homes during his well-traveled career! A local business owner and design professional, the wife adheres to the philosophy that “details make the difference” and has a special penchant for texture. Both have been fully involved in the redesign, which is still ongoing, and they chose Christi Johaningmeyer, founder/owner of Architextures, to oversee the renovation and harmonize their ideas. Recognized by the St. Louis Business Journal as one of the city’s Top 10 Largest Interior Design Firms, “Architextures focuses primarily on commercial architecture and design, so this project has been an enjoyable change of pace for me,” Christi observes. First on the agenda was replacement of the entry doors. Although impressive, the original entry was all-glass and allowed a direct line of sight to the rear of the home. Rich walnut doors now add beauty and privacy to the massive two-story foyer. Wrought-iron spindles line the gracefully curved staircase and catwalk, and the foyer’s traditional chandelier was replaced with four stunning, handcrafted Fortuny fixtures, suspended at varying heights. 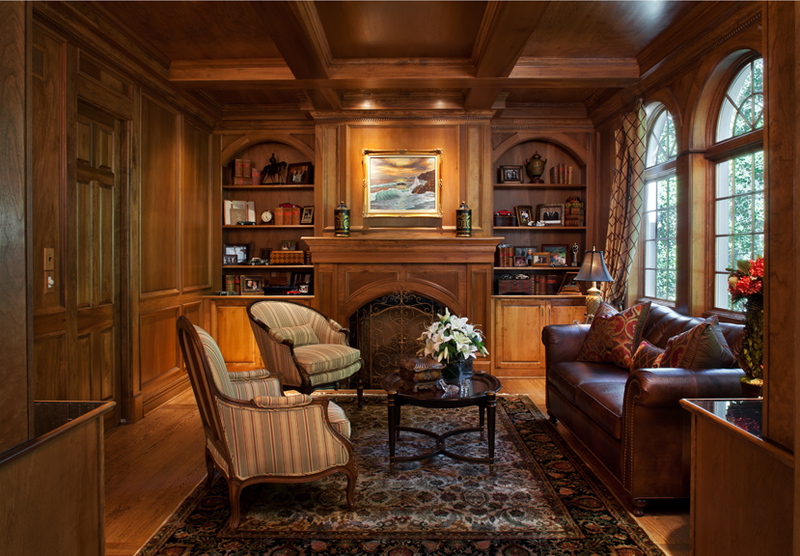 Accessible from the foyer, the wood-lined study and formal dining room are paradigms of understated elegance. Many of the furnishings in both spaces were previously owned by the homeowners and have been blended with stylish new pieces – for example, a crocodile leather sofa and coffee table from KDR Designer Showrooms in the study and comfortable head chairs, upholstered in a muted animal pattern and trimmed in crystal, for the dining table. 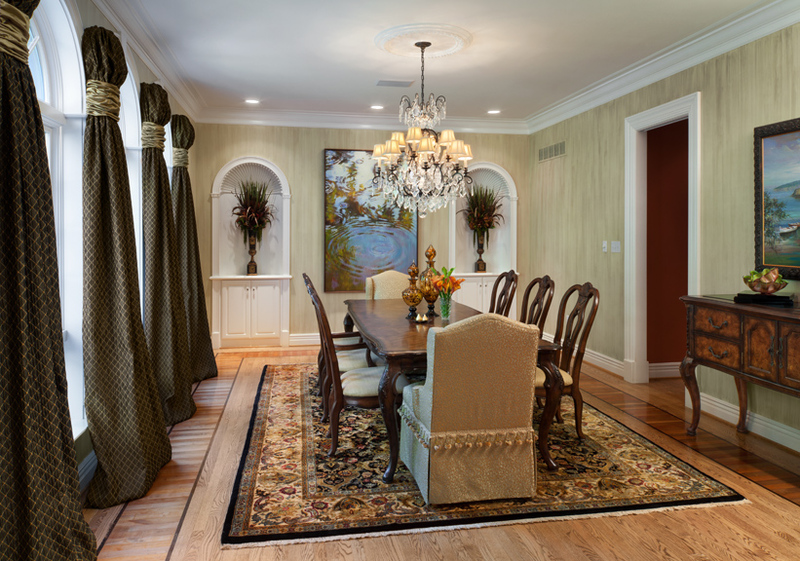 Christi particularly enjoyed designing the home’s unique window treatments, noting that the drapery embellishing the dining room’s architectural windows is her favorite. Her principal challenge was to link the voluminous family activity spaces for a more contemporary, free-flowing traffic pattern, while creating a more casual, intimate ambience throughout the home. To achieve this, she established a focal point for every room and selected a tasteful palette of chocolates, apricots, green and gold. In the step-down two-story great room, floor-to-ceiling windows offer commanding views of the pool area, outdoor kitchen and tennis court, and the Italian silk drapery was designed to accent the windows without impeding the view. Reupholstered in apricot, the sofas are arranged on an iridescent Kaim-Kisner sculptured silk area rug from New Zealand. Formerly stark white, the columns and woodwork were softened to a creamy tone, and an intriguing faux technique – applied tissue paper, painted in sage with a chocolate glaze – gives delicate texture to the walls. The cherry floors were darkened for contrast and a huge antiqued mirror hangs above the fireplace, which showcases a marble surround and custom screen by Perpetua Iron. To better fit the homeowners' personal style, the kitchen was completely renovated. An exterior wall was removed and extended, and two arches were added to integrate the kitchen with the hearth room. Culinary activity revolves around an 8-foot work island, topped with Arctic Pearl granite and illuminated by drum lights. Concealed appliances were a must-have for the homeowners. The Viking dishwashers, enormous double-door recessed refrigerator, and additional refrigerator drawers are all hidden behind furniture-quality cabinetry and fronts by Beck/Allen Cabinetry. A Sonoma Tile medallion adds a decorative touch above the 8-burner stainless Viking range, and the ornately trimmed, cream-colored cabinetry has a chocolate glaze that coordinates with the chocolate-stained island bases and arched refrigerator front. A bi-level island breakfast bar, defined by a handsome arch and topped with matching granite, separates the kitchen from the breakfast room and coffered hearth room, where the arch motif is again repeated on the limestone fireplace surround. One learns to expect the unexpected when touring this fashionable residence. Case in point, in the main-floor privacy wing, the husband’s personal study features crocodile-embossed leather plank flooring and sand-textured walls that have been hand-painted and glazed. In the sumptuous master suite, plush furnishings and soft hues evoke tranquility, and – a subtle alteration – the fireplace mantel was lowered, de-emphasizing the scale of the bedroom. Stretching the full width of the home, the lower-level entertainment area was renovated to fit the homeowners' request of a more open layout. In the original floor plan, the various spaces were accessed from a hallway that was essentially a long, dark tunnel. “We opened the entire space,” Christi explains, and it’s now “hospitality central,” where dozens of guests can simultaneously enjoy the fireside gathering area, billiard/shuffleboard/card tables, AV room, full kitchen and bar. The husband’s only stipulation was “TVs visible from every vantage point." Christi replaced the “tunnel” with cherry plank flooring laid in an attractive harlequin design, but retained the glass block walls of the refurbished his-&-her workout rooms. A temperature-controlled wine room was added, and the home theater was equipped with a 90-inch HiDef screen and theater seating. Suitably enhancing the decor are a jukebox and the husband’s astonishing array of personal and professional sports memorabilia.